Sixteen:Nine has been covering the digital signage industry daily since February 2006. Dave Haynes, founder and editor of Sixteen:Nine, recently interviewed Bruce van Zyl, President of Sellr, on moving the sales needle with BevTV for its podcast. There’s a drink for every occasion, whether it’s a dinner party or New Year’s, the Superbowl or Sunday brunch. Then you’re faced with that difficult dilemma of shopping for alcohol, and the options can feel overwhelming. To help you get the right product for the right price and occasion, Sellr offers retailers a powerful technology ecosystem - equipped with tablets, a customer-facing website, and a marketing strategy- that engages and educates their customers in the aisle. Sellr now partners with BevTV, a beverage-focused ad channel for brands to target their audience with engaging and interactive content in store aisles, right at the point of decision. BevTV is the largest digital ad network in the beverage industry, with access to over 1,000+ devices across US and Canada with an engaged and attentive targeted audience. Dave Haynes: This is 16-9 the Podcast, I’m Dave Haynes. We’re all about digital signage and have been since 2006. We cover what’s interesting now and what will be interesting and important one day soon. We filter out all the BS. This podcast is a chance to add depth and color to what we do online, and it gives smart people a chance to really talk about their companies and their ideas. You can hear new episodes weekly on your smartphone, tablet or desktop free of charge. 16-9 is sponsored and supported by Screen Feed, the digital signers content store. Screen Feed makes beautiful, ready-made auto-delivered and auto-updated content for screens. Dave Haynes: Booze is a complicated thing to buy. All the product categories look pretty much the same so people revert to price, top of mind awareness, or labels and names that just catch their eye. 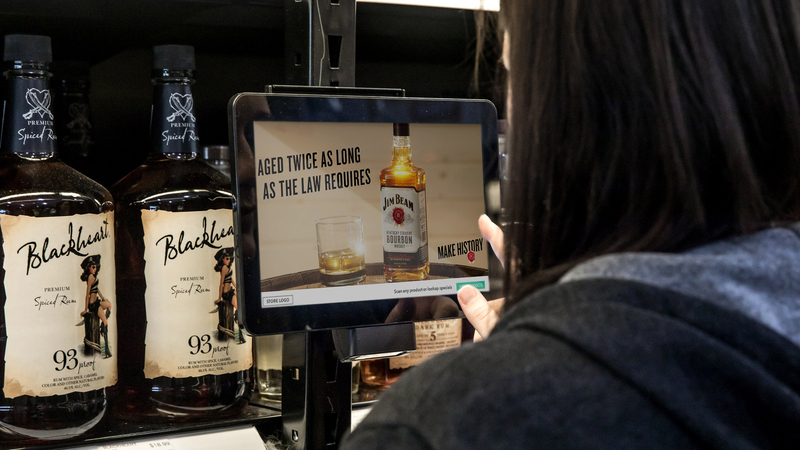 One of the ways to improve that situation is by putting digital right into the aisles of liquor stores where people poke around trying to figure out what they’ll like and what they should buy. Dave Haynes: A company up in the North Atlantic tech suburbs called Sellr, is rolling out Bev TV displays in stores with the aim of helping consumers make more informed choices about buying wine, beer and liquor and maybe influencing what they end up buying. The company got its start in retail hardware but has transitioned fully into software content building up a massive library of curated information about booze that’s tied to universal price codes. They make that interactive content available on commercial grade tablets they install on their nickel at eye level in participating stores. Dave Haynes: I talk in this podcast with company president Bruce Van Zyl about Bev TV’s experiences to date and it’s plans to have 1,000 units running by this summer. Dave Haynes: Bruce, thanks for joining me. We haven’t met before. I think the first thing that would be useful is to clear the fog a little bit for me as to what Bev TV is, what Sellr is and how that fits with OnCue Technologies because there’s kind of a few brands here that I’m looking at. Bruce van Zyl: Absolutely. So OnCue is retail technology company that was started in 2003 and we’ve been doing various technology in different stores. Everything from price checkers to different hardware manufacturing services to custom devices. Then when the iPad came out in about 2008, the company started moving into more software development until about 2011, 2012 moved completely into software space and left the manufacturing business. Then around 2015, we rebranded the company as Sellr, and Sellr is a platform that’s helping retailers. “Help sell better with Sellr” is our tagline, and we’re helping market products on line and market products in store and making it just as easy to use and as simple as possible. While we have a lot of these stores who happen to be particularly in the beverage space, we actually just recently, last year, launched Bev TV, which is a network of tablets that they put to the brands kind of push comment, educational content, promotional content to these devices when they’re not in use. So it benefits shoppers, benefits retailers, and the brands now have a new marketing channel. Dave Haynes: Yeah, I became aware of Bev TV because you joined the DPAA. I was a little bit curious about that because it would strike me as your tribe, so to speak, would be going direct to the different liquor manufacturers, liquor brands like a Diageo and so on as opposed to going through media planners. So what’s the thinking behind joining the DPAA? Bruce van Zyl: We’re looking ... we’re new to the advertising space looking for just membership, kind of accreditation, something to help give some credibility. We met them through some mutual contacts and it seemed like a great fit. They’ve just helped to introduce us to some other key partners that have really helped move our business forward. Dave Haynes: Okay. Is everything that you’re doing ... well let’s back up a little bit. What’s the footprint right now of Bev TV? Bruce van Zyl: Right now, we have about 300 tablets sold in to about 27 different states. We’re quickly growing. We should be around about a thousand installed tablets by September, October this year. Dave Haynes: And is that the primary feature set, is a tablet, from what I’ve seen, at eye level in the liquor aisles? Bruce van Zyl: Yeah, that’s correct. There’s a ten-inch tablet that is interactive. So it’s showing this as kind of a TV content that just kind of runs continuously. But there’s also a way that the retailer is also featuring their store logo and there’s a little button where they can tap to view specials. Then we’ve taken the shopper into kind of an interactive experience where they can look up products. There’s a scanner where they can a value pc on any product, look up details, which is particularly helpful in the beverage space, where it’s a very confusing industry for a lot of people. Dave Haynes: And who owns that content? Is that something you’re developing for them, or is it something the stores have? Bruce van Zyl: So, this is something we generate automatically for the retailers. One of the biggest problems we saw in the last few years is that content generation is, of course, one of the obstacles you have to overcome in this space. So, we found a way to build an existing database of products. So, we have about 165,000 products, ranges from different aisles. Beer, wine, spirits, we’re also in other aisles, but particularly in beer, wine, spirits, and then matching all that content up to the UPC, which sounded like an easy task, but then its taken years to perfect to make sure that every bit of content has a UPC attached. Bruce van Zyl: So when a store joins, they basically list the products they want to promote, giving us a UPC and a price, and then we’re able to match that up with our database and dynamically generate content to help promote those particular products in their store. Dave Haynes: Okay. And that database, is that something that you can buy? Is there another company that’s kind of building all that? Bruce van Zyl: That’s all our data. We built that from scratch. Bruce van Zyl: Yeah so it’s been a long journey, but we have a team of 25 product editors who are full-time. That’s their job, just checking, curating, cleaning up our database. Dave Haynes: They don’t get to drink the products? Bruce van Zyl: But we do have ... our lobby has about a thousand bottles of liquor and I hear most of them are still full. Dave Haynes: Where’s your lobby? I can help. Dave Haynes: Being at the eye level, I’ve seen other programs like this in supermarkets and mass merchandise and so on, and I’ve always found it kind of interesting because when I talk to the companies that are doing it, they say the take up rate, the sales rate from when they promote particular products on these things is mind wobblingly good. What’s been your experience with, let’s say you have a particular California cabernet that’s running on these eye-level screens, is it driving sales? Bruce van Zyl: Absolutely. We’ve done different metrics, of course. There’s so many factors when you’re looking for a stat like that, but we’ve seen somewhere ... it could be anywhere from 10% to 15% lift, and I want to qualify that. When we’re promoting products, we’re also promoting it online, it’s on their website, there’s a few other places where these products are being seen. We’ve kind of found a sweet spot. Promoting less than a hundred products is better. The fewer products you promote, the more impressions you’re going to get, all that, and we’re going to ... but it depends on, of course, the size of the store. We have some stores who want to put 600 featured products, so a lot of this is just educating the retailer and finding that sweet spot of what’s the optimal amount to promote, and then of course trying to see the lift in sales from that. Dave Haynes: Okay. And how many do you put into a typical store, or is there a typical? Bruce van Zyl: We’ll start with at least three. We like to go in with one beer, one wine, and one spirits, and then we do multiples of three. So we have three, six, nine, and twelve is typically what you’ll see. We do have some stores with twelve to fifteen tablets, but typically it will be between nine and twelve. Dave Haynes: Is that tied to the footprint? Bruce van Zyl: Absolutely. We’ve got some stores that are 15,000 square feet, we’ve got some smaller stores that are 3,000 or 4,000 square feet, so we’re really trying to have them every six to ten feet inside the store. At only ten inches, you have to have a lot of them to make an impression throughout the store so it’s part of the experience. Dave Haynes: And so if you’ve got a lot of different promotions running because that’s what the retailer wants, the frequency of the individual spots drops, right? That’s the issue? Bruce van Zyl: That’s correct, yeah. If you’ve got 600 products and they’re each on the screen for six seconds, it’s going to take a while for that product to come around again. Ten products, you’re going to see it a few times while you’re walking down that aisle. Dave Haynes: So how do you get around that? Bruce van Zyl: Mostly it’s been around educating the retailer, working with best practices. They have ... I provide a dashboard for them to help manage what products they’re promoting, what products they want to just have listed on the tablets, and then certain products they don’t want to show up at all. That may be specialty products, things like that. So we help maintain that. We’ve got recommended sizes based on ... if you have 12,000 SKUs in your store, here’s recommended practices on that. A lot of education, I think. Dave Haynes: Is there a certain type of content that seems to work better? Is static better than video or vice versa? Dave Haynes: About six seconds. Bruce van Zyl: So trying to get ... six seconds, exactly. So we’re trying to get something really interesting very quickly, and then grab their attention. Things like cocktail recipe videos, someone making a cocktail recipe. Something like that is particularly ... we see a lot of interest on that kind of content. Dave Haynes: Right. Now you’re using the tablet and you mentioned iPads off the start. I’m curious how that went because what I’ve seen of the images suggests those aren’t iPads. Bruce van Zyl: They’re not. Dave Haynes: You’ve gone to something that’s more commercial grade. Bruce van Zyl: Exactly. About two years ago, we were revamping our entire application process and figuring out kind of what technology stack we wanted to use, and we were so focused on the software, we really didn’t want to worry about the hardware, so we made a quick decision early on to just go with an iPad in a case, and we had found a great partner to build these cases for us, and it was great when we just needed to focus on the software, but as soon as we started coming back to getting ready to scale, we never got more than ... less than a hundred iPads out in the field, and have gone through the painful process of replacing all of those. So while it was a good partnership, they’re just obviously not designed to be used 24/7. We had batteries exploding ... not exploding, that sounds dramatic, but they were popping out and bulging out of the back and all kinds of random issues that when you run them 24/7, they’re not designed that way. Dave Haynes: Yeah. So you moved to a commercial device. Is it like an Android tablet? It almost looks like a Chrome. Bruce van Zyl: It is. Yeah. It’s an Android tablet that’s running our own application to manage the software and something we built, and the complex part of what we do is that we have to have this scanner integration, so we have a high speed CD scanner attached to the bottom of the device, and it basically just lets you wave the barcode in front of it, and within one to two seconds, you’re looking at content about that product from our database. That’s kind of the key thing, and was the most challenging to have that on the iPad as well, whereas when we moved to commercial grade, it definitely solved that problem for us. Dave Haynes: Now there’s this whole segment out there that says if you’re going to do anything around consumer engagement, blah, blah, blah, blah, that you have to have a direct handshake with their smartphones so that they can do something with their smartphone with this screen, or take things away and so on. I’m a little skeptical of that in a lot of circumstances. What’s been your experience? Are you doing anything around marrying the two devices? Bruce van Zyl: We’ve kept it ... simplicity is key when you’re doing new technology. I think when people try and get them with something that’s very complicated, it’s often difficult to understand for the shopper and the retailer, and even the brands who are typically more on the cutting edge of this, the advertisers. Keeping it simple, we came up with an option very early on, which ... I’ll back up. When we used to do these tablets, we used to manufacture them ourselves five years ago. We actually had a printer, like a receipt printer that was attached to the device, and so the concept of walking away with the content was ... we’ve had that in our system for a long time. So we needed a digital way to do that, so we came up with a very simple option. If you’re looking at a cocktail recipe or any kind of content, you can just enter your phone number and it will just text you all that information. So you walk out with a text or an email, so that’s been the most effective, again, very low cost, very simple solution, but it gets the job done. Dave Haynes: Yeah. You don’t have to turn on Bluetooth, you don’t have to find a QR code scanner in the blizzard of apps you have. Bruce van Zyl: Yeah. We have mostly millennials working at our company, and so we constantly are kind of questioning ourselves, “Is this something we would want to actually use or not?” And that’s where QR codes ... I don’t think anyone on our team can remember when they used a QR code last, downloading an app for a particular retailer, especially somebody like a beverage store, where it’s a little bit more ... you’re not exactly going there multiple times a week, you’re going maybe once every two weeks possibly or once a week at the most, but we just didn’t feel like we would do that for ourselves. We wouldn’t download an app just for this one retailer. Bruce van Zyl: I know there are companies making apps for the beverage stores, and that’s something we’ve just stayed away from because you’re in the aisle, you’re there to buy a product. We have a saying around the office, “Nobody goes down a beverage aisle to browse.” You’re going there to buy something. You are not going to see the latest wine that’s now available, you’re going to pick up something for a party, you’re going to buy something as a gift, you have a dinner you need to pick something up for. So you’re there to get something, and really all we’re doing is helping you get the right product sooner, and then obviously helping to make that experience as seamless as possible. Dave Haynes: It takes time and real money to make and host this podcast, so I’m grateful for the continuing support of Screen Feed. Jeremy Gavin: Hi, this is Jeremy Gavin, CEO of Screen Feed. I hope you’re enjoying the podcast as much as I am. I’ve loved Dave’s vlogs since we started in the industry. It’s now our tenth year as Screen Feed, and we’ve grown to be a reliable partner for the industry, serving over 1700 customers with over a hundred thousand screens globally, and we’re currently getting ten million content requests daily. But more important than that is that we make content beautiful, functional for the medium, and we help our customers meet their goals of increasing viewership and satisfying customers. Jeremy Gavin: If you want to know how Screen Feed can help you, it’s worth five minutes to browse our website, or give us a call. If you’re out walking your dog, driving home, or relaxing on your favorite chair, make a mental note to check us out. Now, back to the podcast. Dave Haynes: I’m sure the app companies would dearly love to buy your database, but why would you do that? Bruce van Zyl: We actually ... we make it available via APIs. One of our products, we actually do work with a number of app developers on that net space, yeah. Dave Haynes: But you sell it to them? Bruce van Zyl: Of course we do. Dave Haynes: Well, sometimes there’s open APIs and open source stuff, but I wouldn’t understand why you would do that. Bruce van Zyl: And there are services out there. I think the problem with something as ... when you’re dealing with quality products like wines and spirits and stuff, you’ve got ... if you’re buying a $100 bottle of whiskey or some of these finer products, the quality of that database is everything, and that’s something we’ve had to bring in-house in order to control. So that’s why we developed that, we’ve listed it as the largest beverage database that’s also attached to UPCs for that reason, because from what we can find, there’s nothing else out there that has that same database with all the items that we have and also linking it to the UPC. Dave Haynes: Right. The other thing that I’ve seen in liquor stores, I certainly see it promoted at trade shows, is this idea of having some sort of a sensor associated with feature bottles so that you lift the bottle up and up pops something on the screen that’s related specifically to that product. Do you see that as viable or does it just simply take up too much space? Bruce van Zyl: And I think they’re trying to create some hybrid technology, that’s kind of one of our missions here is to try to integrate some of that online technology, bring it back into the aisle, but keep it so simple that ... a simple integration with a POS system, and then this tool is now on and working. So you have to do it on scale, you can’t just do it for a particular brand or a particular set of products. You have to be able to do it across all products, especially if you’re going to do something like that in the beverage space, there’s just so much variety. Dave Haynes: Who’s nickel is it to put these things in? Is it the retailer or is it your company? Bruce van Zyl: So the majority of it is being financed by us, and what we do is we offer subscription packages for the retailer to upgrade this different set, so depending on how many tablets you have, obviously it costs a little bit more for the retailers, and we give them different features. There’s the coveted POS integration in the spaces where all the magic happens, and that’s sort of our top tier. That means all your pricing, all your products get synced every couple of hours with our system, and that just makes it extremely useful. If they put an aisle on sale from their POS system, it automatically starts promoting that on the tablets. Things like that, that kind of level of automation. That’s one of our most popular features and one of our most popular plans because of that. Dave Haynes: So it will work pretty nicely just on the base level, but it’s going to be a little clunky if you’re changing pricing frequently? Bruce van Zyl: Yeah. We limit the amount of products you can put in on the base level. We don’t let you put in your own content, so you can’t put ... if you want to create a graphic or a video that promotes a wine tasting next Thursday, you would have to be on one of the premium plans to do something like that. Dave Haynes: Right. Would you use larger displays, like 22-inch displays, if you could? Bruce van Zyl: Yeah. We’ve actually played in specific installs. We’ve done everything from ten, fifteen, and 22-inch models. That just depends on the store and it really comes down to how much real estate you’re giving up on the shelf. It’s all about that shelf space and keeping that to a minimum. That’s something that we’ve found. This ten-inch device has kind of become our main go-to device. You can actually see the labels of the wine bottle above it if you place it right in front of a bottle, and it doesn’t take up room below the ... for the next product below. So it’s just a perfect sweet spot and we just end up installing more of those, but we have done greeters and other technology in the front of the store with larger displays. [inaudible 00:20:37] for sure. Dave Haynes: Is there a delicate balance of how many of these you can put in? I know you talked about groups of three earlier. If you had the opportunity and the financial clout and everything to double up the numbers of displays you’d have in a particular store, would you do that, or is there a risk of saturation? Bruce van Zyl: I think that we would absolutely put in as many as possible. I think what would happen then is we would go to different levels of targeting for the products, so rather than walking in and seeing all products across all tablets, we would see much more specific. Instead of just doing spirits, you may see a scotch or a whiskey being promoted in that scotch and whiskey aisle. You may see very specific targeted ads start to happen, so we’re absolutely exploring that and would be interested in pursuing that kind of level of targeting. Especially for the advertisers to push content, not only to that store and to that shopper, but to that aisle where there’s someone else possibly looking to purchase their competitor’s product. Dave Haynes: Now I’m in Canda. We have provincially run liquor stores here versus private enterprise. In the US where you’re based, it’s kind of all over the place. Most are private, but there are some state run. I assume that gets complicated, and how do you deal with going into stores that aren’t just privately run chains? Bruce van Zyl: Great question. We’re located in Atlanta, Georgia, and in Georgia you can only legally own two stores that sell spirits ... can be kind of under one owner. So for that reason, we’ve not done a lot of stores in Georgia because there’s no large chains inside of Georgia. We’ve typically gone outside to look for those larger chains. That has been an issue when it comes to scalability. If you can go into one store and then have them replicate that model to all of their stores, it’s obviously much easier. So we start with the larger chains for that reason. We are actually in a number of stores in Vancouver and throughout Canada, so we’ve dealt with that in different scenarios as well. Dave Haynes: Is it tougher because there are ... I don’t live in British Columbia, but I suspect there is a government thumb on any liquor sales activities that’s maybe a little heavier than it would be in pretty much any US state? Bruce van Zyl: Absolutely. And again, it’s state to state, so it’s extremely complex, but there are all kinds of legal requirements when you’re promoting alcohol in a store, who can promote it, how are they displayed, how you position that product. That’s been one of the challenges we’ve had to overcome in the last few years is how to do that. And then also, once you do figure it out for one state, how do you then adjust that and modify it to different states for different laws? But absolutely, that is one of the challenges. I think if we had to redo this product in a different industry, I don’t think we would pick beverage. Although it sounds fun and we have the lobby with a thousand bottles here, it definitely creates its own unique challenges. We have to create solutions to get around those. Dave Haynes: I guess on the flip side, though, it’s a retail industry that’s less at risk than perhaps many others because the bottles are big and they’re fragile and expensive and everything else versus commodity consumer packaged goods products that you can ship anywhere in two hours. Bruce van Zyl: Replace it. Possibly. Or tomorrow. Who knows? Dave Haynes: First name basis. What would you go into next then, or what else are you into? I’ve certainly seen, as I mentioned earlier, mass merch where you’ve got body lotion and shampoo kinds of products that are using these shelf edge displays and seeing some real action. Bruce van Zyl: We like to think that we’re helping shoppers pick out products ... what we could define as complex products. Helping to make that purchase decision easy when there’s a lot of complexity. So wine naturally is complex. You’ve got food pairings, there’s different levels of sophistication in how you pick the right wine. The next thing I think would be somewhere in the health space where we’ve got things like vitamins and supplements. If anyone stood in front of the health aisle in a CVS or Walgreens possibly. There’s just an amazing amount of options there, and they all have the same ingredients, but all different prices. So how do you pick the right product? Something like that, I think ... we’ve already started delving into that a little bit, but that’s going to be our next mission here. Dave Haynes: Yeah. That’s very, very complicated, but it’s an interesting industry because they’re ... as one guy from GNC told me, their margins are exotic. Bruce van Zyl: Yeah. Absolutely. Dave Haynes: Costs them five cents to make a pill and they sell it for a buck and a half. Or more. So your company, is it privately held, are you VC funded? How does that all work? Bruce van Zyl: Yeah. We’re VC funded and have been for a number of years when it was acquired, I think back in 2010. I joined the company in early ... end of 2015, and so I’ve been here for just a little over two years. Dave Haynes: And how many people now? Bruce van Zyl: When we started we were a team of seven or eight, I believe. We’re now pushing ... almost 30, so we’ve grown quite a bit. Dave Haynes: So the investors are hoping you scale out way beyond a thousand screens pretty quickly, right? Dave Haynes: What are the barriers to doing that? Bruce van Zyl: Barriers would be, I think just retailers adopting the technology and scale. We do have a number of much larger retailers we’re working within small pilot stores, so when you’re going in for six to nine tablets, you don’t need that many stores to hit a thousand screens. It scales quickly. If you’ve got 200 plus stores in your brand, that’s something that we’re looking for. That kind of [inaudible 00:27:05]. We’re talking to a number of retailers that are on that scale, so that kind of helped guarantee that this will get over a thousand this year. Bruce van Zyl: It’s very simple to install in terms of how we do it. We basically cover the costs associated with the install, so we actually come out, install the tablets in the store. There’s really no effort on the retailers side, other than just allowing us to put them in the display in the store, and then, of course, they’re able to upgrade and start to use the services as they need to at the location. We try to make it ... try to remove as many of those obstacles as possible, of course. Bruce van Zyl: I think as it scales, tracking the lift of sales, tracking the actual how does this move the needle from a sales standpoint is going to be a key driver for us to really make this a no-brainer. Everybody wants more screens, high tech the store, more targeted advertising, things like that, but I think once you start to push the boundary on actually pushing sales up and seeing that lift, I think that’s where we’ll see a much faster adoption as well. Dave Haynes: Alright, Bruce. Thank you. Bruce van Zyl: Very good. Thanks for having me here. Dave Haynes: That’s it for this episode. I hope you enjoyed listening and learned something. If you want to stay on top of what’s happening that actually matters in digital signage, join thousands of readers who visit 16-9, that’s 16-9.net, every day. If you like this podcast, please also check out the companion 16-9 podcast called ‘Projects’. That’s done by Michael Tutton and there’s a new episode every second Friday. 16-9 the blog and now the podcast are properties of Vertical Media Consulting Group, the massive media empire I run out of a spare bedroom in my house near Toronto. Dave Haynes: Thanks to our podcast sponsor, Screen Feed, and thank you for listening. I’m Dave Haynes.